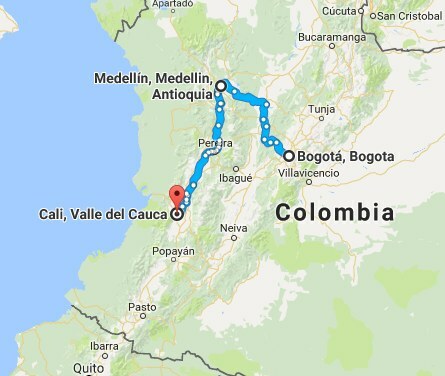 Avianca is showing some pretty great prices from Toronto to Bogota, Medellin, and Cali, Colombia for as low as $451 CAD roundtrip including taxes. The flights are quick, with less than a 1 hour stop in San Salvador, El Salvador each way. About the only time there have been cheaper flights than this from Toronto to Colombia, is on the odd occasion when AeroMexico has dropped their flights into the $300s CAD roundtrip. Those flights are usually long journeys though, with lengthy stopovers in Mexico City. 1. Try starting with one of these Kayak searches..
For flights from Toronto to Cali (CLO) or Medellin (MDE) - Once you get to Kayak, click on 'Change' and change the destination. Run the search again. The available dates will vary. 2. Click through from Kayak to FlightHub or the Avianca website. What about flying into one city in Colombia, and then home from another? Flying into Bogota, and back home from Medellin, for example, you should be able to find similar prices. Click on 'Change' to try other dates. Try using departure and return dates that are the same as in the Kayak links above. If you're willing to put up with 2 stops on the way home (one of them being a 5 to 17 hour layover in Bogota, there's a range of options), you can fly into Bogota, Medellin, or Cali and then home from Cartagena (CTG) for about $30 more. toronto, yyz, flight deals, south america, colombia, medellin, mde, bogota, bog, cali, avianca and clo. 2 Responses to "Toronto to Bogota, Medellin, or Cali, Colombia - $451 to $499 CAD roundtrip including taxes"
I follow the YEGdeals and notice at times, sales start in Toronto and then come to Edmonton/Calgary.. Do you anticipate this sale to Colombia will come our way any time soon? Before booking this trip, I thought it better to check in. On certain routes, and with certain airlines, that definitely does happen. Unfortunately Avianca does not fly out of Edmonton (or Calgary) so similar prices are not likely to become available from Alberta. AeroMexico starts flying out of Calgary in June, and they might help bring prices to Colombia down from Alberta (and to other places in Central and South America) , although their flights often have long layovers in Mexico City.